The book that….may have gotten me into science fiction. I gave this book 5 stars on Goodreads because it was amazing! This book was super good. I was reading it during a very busy time during school so it got sort of broken up for me. I think I would recommend that if you are going to read it, read it during a time when you can fly through it. It is a very fast-paced read and I ended up finishing the last 150 pages of it in one day when I thought I would only read about 50 pages or so. I just had to see how it ended. When I was reading, I loved everything that was happening on Mars. However, I felt that the parts that took place on earth were much less interesting. There were times when it added to the tension so I understand why the author put them in there but I tended to want to get back to the Mars portions because they were so engrossing. The writing in this book was not phenomenal, however, it didn’t hinder my reading of the book and this is a debut book which is understandable. I did think the author did an amazing job making the science-y parts of the books very accessible for those who don’t know a lot about the sciences being discussed. I think this would be a great book for someone who is looking into reading sci-fi but doesn’t know where to start or is intimidated by it. I am not a sci-fi reader myself but quickly got pulled in to this book. I think it is a great place to start in that genre. If you have read it, please let me know your thoughts down below. I would love to hear your opinion. Today I am bringing you my wrap-up for Bout of Books 13 read-a-thon. 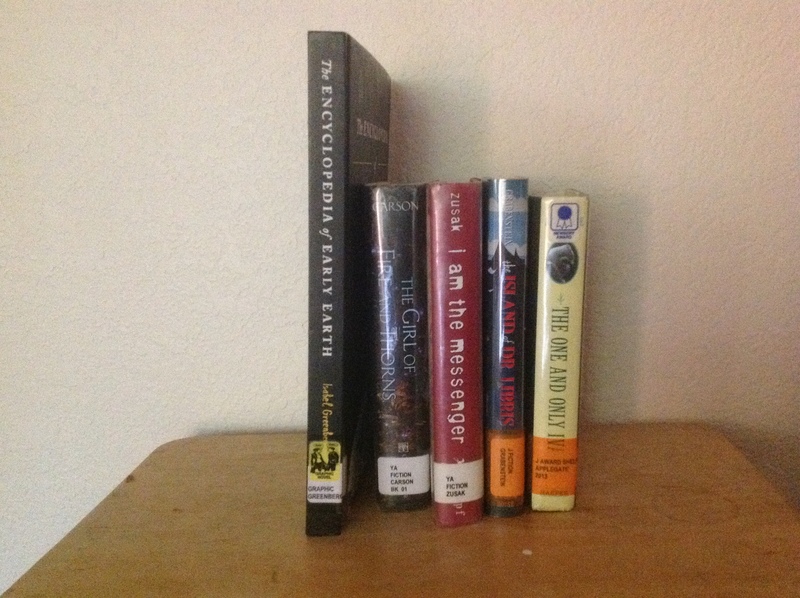 I had a blast participating in this read-a-thon and actually got quite a bit of reading done. I went ahead and marked my progress each day of the week so you can see how I did. Nothing! It was my sister’s birthday, so I was spending time with her this day. Overall, I am very happy with how much reading I got done. I loved having The Encyclopedia of Early Earth to blaze through at the end and Adulting to read throughout the week. I always love doing read-a-thons and had a wonderful time dedicating this past week to reading and making reading a priority. If you participated, feel free to let me know how you did. I would love to read about your progress and your experiences with the read-a-thon. 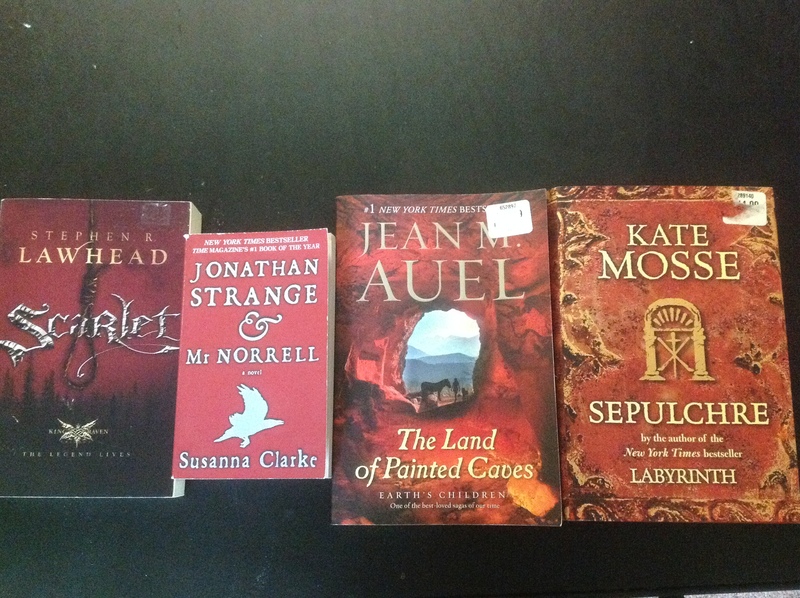 For today’s challenge, I had to find 4 books with matching cover colors. I went with red as my main color and then there are yellow and white accents on the books. I have not read any of these books so let me know if these are ones I should get to soon. Make sure you go check out the challenge here and see what books and colors other people chose. As far as my progress goes in reading for the read-a-thon, I have finished one book and am halfway through another. I will be breaking into the children’s books here in the next few days to fly through some books. Up next is The Island of Dr. Libris by Chris Grabenstein. If you are participating in Bout of Books 13, let me know how you are doing. Let’s knock out some reading this weekend! I have not done any reading yet today which is a great way to start out the read-a-thon (-_-) but after this, I plan to grab a cup of coffee and get some serious reading done. I decided to participate in the challenge for today. It is called the Bookish Survey Challenge and I basically just answer the 5 questions below to tell you a little more about me. Right now, the are organized by genre. However, I have been known to organize them in many different ways such as by color, size, alphabetical order, etc. I loved Fangirl by Rainbow Rowell which surprised me because I do not usually like contemporary books. If you have not read this book, you should check it out as soon as possible. It is a truly magical story. That’s all for me today! Make sure you check out the challenge here and check out everyone else’s answers linked on that page. I decided to stick with quick reads for this read-a-thon so hopefully I will be able to get through a lot of these during the week. If I feel like reading something else, I will probably read some short stories or a few chapters in Anna Karenina. As far as my posting goes, I might just do one big wrap-up at the end or update you guys once or twice throughout the week. I probably won’t do a post every day because that just ends up taking a lot of time. If you are joining, link your post below or tell me what you are going to be reading in the comments. Here’s to an awesome week dedicated to reading!